The objective of the Welcoming Ministry is to make Church of the Holy Family a more welcoming parish. 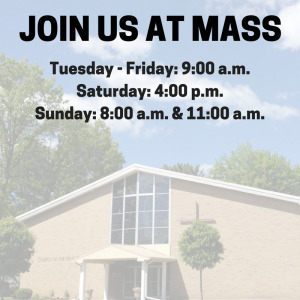 We want to make all new parishioners feel welcome in their new parish home. A meet and greet is scheduled between someone on the Welcoming Team and the new parishioners. We distribute to them a church tote bag that includes a new parishioner welcome packet. Included is a prayer pen, a loaf of bread (as we share the bread of Christ with one another), and token items for the children in the families.